Last week, I was lucky enough to escape from my children and go on a brief trip to New York with my husband. It was also a chance to visit my publisher for the first time. It still amazes me to not only have a wonderful agent, but also (unbelievably) a real publisher. So when I arrived in front of the HarperCollins building on a cold and rainy day, I was starstruck and couldn’t resist taking a number of photos, none of which were particularly in focus. My editor met me in the lobby; we had exchanged emails, phone calls, and revisions but it was such a treat to finally meet her in person. As we exited the lift, she remarked that the building was very “Mad Men” and that they were due to move offices next year, but I was too busy gaping at the large, movie-poster size book covers that adorned the hallways. Books by famous authors like Isabel Allende, Elmore Leonard, and Neil Gaiman. I had the urge to rush up and touch the glass, but luckily we went in to meet some people from publicity and marketing instead. Sitting around a table with three attractive publishing professionals was slightly surreal. On one hand, we were discussing a product that would be launched in August. On the other hand, this product was literally a figment of my imagination. It raised a lot of questions about the exact moment when something as ephemeral as a thought becomes reality. In the meantime, I thoroughly enjoyed talking to them and was vaguely surprised that I hadn’t been evicted yet. 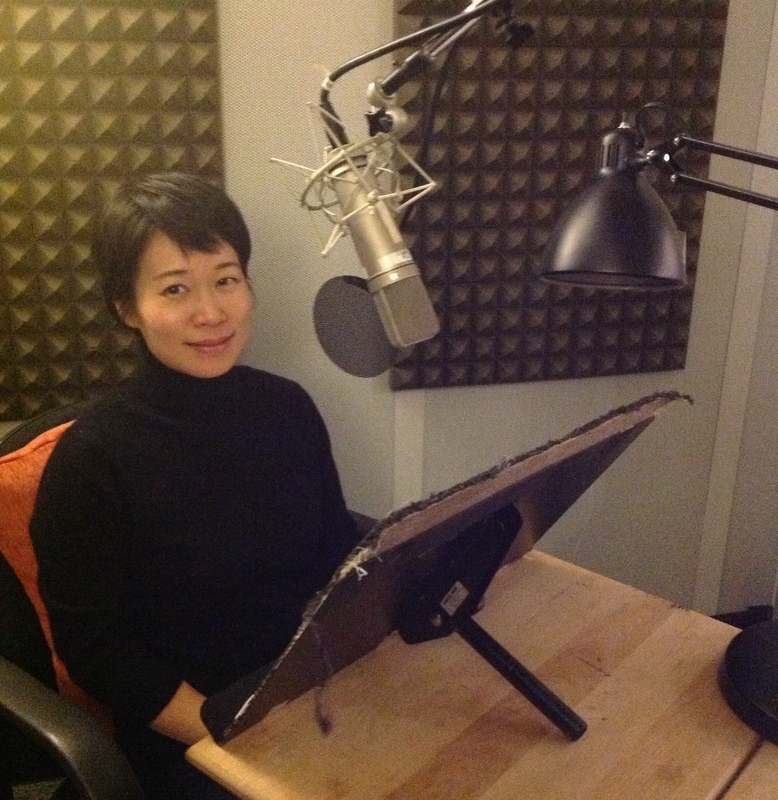 Later that afternoon, I went with HarperCollins’ charming audio producer to do a test reading for the book. 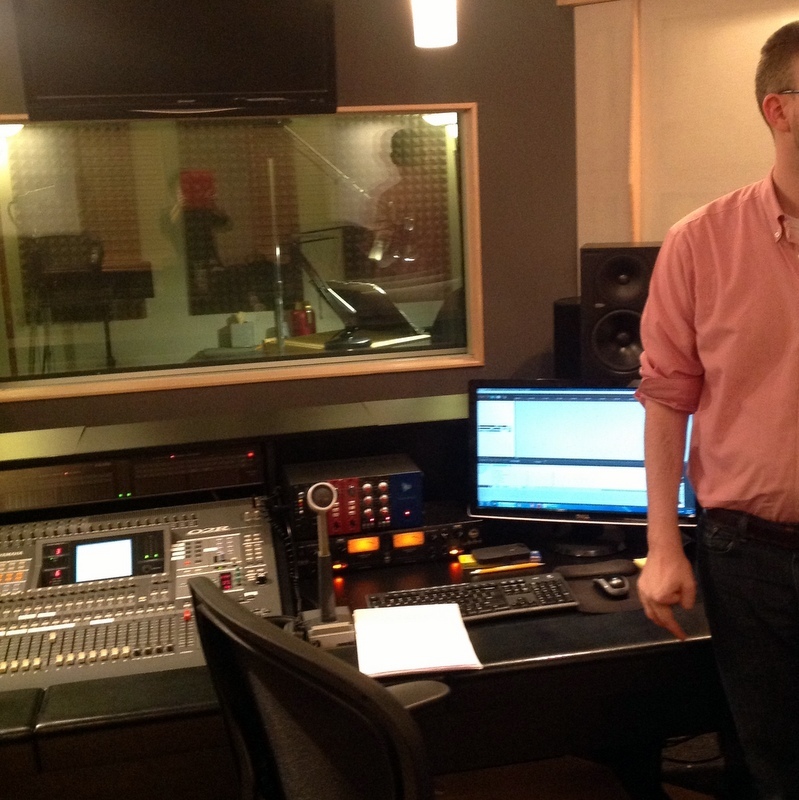 Visiting the recording studio was the culmination of all my NPR fantasies, and the experience of being directed by a real director, with a real audio producer, and a real sound engineer, was both nerve-wracking and so much fun that I couldn’t stop beaming. We ran through two chapters and the upshot was that I’ll be narrating the audio book for The Ghost Bride. “Is it going to be abridged?” I said, looking at the pages of dense text and wondering which idiot had written it. Oh, that would be me. The actual recording will be done in a studio in California later this spring, and I suspect it’s going to be a challenging, yet memorable undertaking. Why are there so many characters in this novel and how am I going to make voices for all of them without sounding like a muppet? These are some of the Deep Questions that I clearly didn’t ponder when I leaped at the chance to do a test reading. There’s loads of Chinese dialects as well, including one which I don’t speak. “Because the cook is Hainanese.” In colonial Malaya, people from Hainan entered the cooking profession in droves. “Aiya, why did you do that? My own mother is Hainanese and I can’t even speak it!” he pointed out. I really had nothing to say, other than the fact that I never expected this book to be published, or made into an audio book, let alone read by me. I shouldn’t tell you all these things, lest you give up hope and nobody buys the audio book, but really, truth is stranger than fiction. If I had thought all those years ago when I was hosing down the cafeteria floor in university or staring at a financial spreadsheet with bloodshot eyes, that I might actually have the kind of job where I could wander through the doors of a New York publisher and fool them into letting me read my own book, then I might have planned it a little better. But I am deeply, deeply grateful for the way things turned out. So, if you are secretly writing a manuscript in the dead of night, or pondering plot points while your children race around the house like circus ponies, I want to encourage you to keep on writing. These things can actually happen, so don’t give up! I’d like to thank my wonderful editor and the rest of the team at HarperCollins and John Marshall Media for making time for me last week. And a big hug for my mother-in-law for watching those ponies, er, children while we were away. How excited you must be! I am curious to find out how was the decision made on who will read the book. I always have an audiobook running in the car, and they were right when they told you that the customers prefer unabridged versions. Do you speak English with an accent? I’d guess that would add to the experience. I am looking forward to THE GHOST BRIDE, and since my birthday is in August, might be asking for the audiobook version of the story as a gift from my significant other hehe. Thank you for posting about the process. I might still be looking for an agent, but it is so encouraging to read debut author’s blogs. Please keep us updated. From what I understand, although many non-fiction are read by authors, most fiction books tend to be read by actors because there’s more dialogue and drama involved. They also try very hard to get foreign words right (the audio producer told me about trying to obtain a recording of Comanche for a particular book, so that the actor could hear the correct pronunciation). In this case, I told them that if I wasn’t up to snuff, to please find an actor instead. 😉 There’s nothing so bad as listening to an audio book read by an annoying reader!! so thrilled for you! just absolutely tickled. Ha ha! Keep at it — soon your pony can go to preschool and you’ll have more time to work on your book! I’m so excited for you, and I loved reading this post! It encourages me to keep looking for a publiser for my own creations…. Do you feel like writing about your experiences looking for an agent in the first place? I’d love to read about hos that worked out for you! Hmm, that’s a good idea and maybe I should put it in the pipe line…you should keep writing, I love your blog and have been missing my internet dose of Sicily! Aahhh! Just saw this — yes, yes, please write a book review! I’m so sorry to hear about your son and hope he gets well soon. Tummy problems are very debilitating, especially for little kids (and their mums). Thank you for sharing such exciting news. It’s encouraging and fascinating! Congratulations! I’m so excited for you, Yangsze! Now I want to read your book AND listen to the audio. I love that it’ll be your voice reading your words. Congratulations! What an exciting event. I hope this day comes for me too. Very inspiring post, thank you. Thank you for this encouraging post! I’m a business student but I only did that so I could pay rent; it’s always been my dream to be a fiction writer. I’m about to start working but I don’t ever intend to give up reading and writing. Do you have any tips for obtaining validation from agents and eventually publishers? I’d love to hear more about your journey! At some point, I should probably write a post about this, but in the meantime, you might want to read a blog post that my agent, Jenny Bent, wrote about how she and I connected. Thank you for the link and your prompt reply 🙂 Very helpful! I am listening to the audio book right now! Well, not at this precise moment, but you know what I mean. You did an AMAZING job with it! The story is incredible and your reading of it is masterful. Thanks for sharing both with me! is nevertheless lot to be seen.